Though I didn’t realize it at the time I experienced the reality of this just the other day. Today, June 13th, Mark and I are celebrating our 37th wedding anniversary! Mark received a gift certificate for his birthday to The Grange restaurant up in Warwick, so we decided to use it this past Sunday. After enjoying an incredibly delicious meal and reminiscing of many years together, the waitress brought the check. As Mark handed her the gift certificate I mentioned that we used it to celebrate our 37th wedding anniversary. I could tell by her response that she was really amazed at the amount of years we had been married. She then said that she and her boyfriend had been together for four years and that it had been a lot of hard work. A door was opened to explain my faith! I could have just responded with a simple answer like, “Yeah, it has been a lot of work for us as well.” But to answer with something that left her thinking we were married for 37 years because we worked hard at it or that it was because of how great we are, would have been unexplained faith, and it would have been useless. To answer in any way that led her to believe it was because of us would have denied the grace of God and the glory that belongs to Him. Then I told her I appreciated a song that was played while Mark and I were eating, “This Little Light of Mine.” I told her that it is my prayer that our family shine as bright stars in this dark world. She asked me what book that was from. I said it is in the Bible, in the book of Philippians. Then she said that her favorite verse is Philippians 4:13. What?! She knows the Bible?! She has a favorite verse?! So, I encouraged her to read through the book of Philippians because there are a lot of other really good verses found there! As we rode home that evening I thought through our short, but amazing conversation. I realized that was an example of explained faith. I realized, though it wasn’t planned and intentional, that is how God intends for me to live. I’m sure that young woman has a praying mother and perhaps that opportunity to share our faith was an answer to her prayers. Perhaps our example of God’s grace through 37 years of marriage and our words of truth watered those seeds that her mother planted years ago and will continue to grow salvation in her heart. And you can be sure I have said several prayers for her as well! But not only is it useless, it denies God of the glory He deserves and it keeps God’s truth hidden from others who need to know Him! 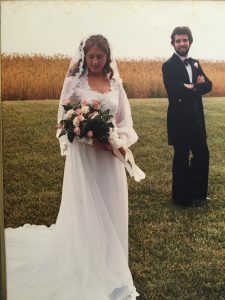 So, as Mark and I celebrate 37 years of marriage this year I am thankful for the opportunity to testify of God’s amazing grace to a young woman who needed to be reminded that, “(She) can do everything through Christ, who gives (her) strength. And though relationships are hard, God is the One who makes them last. There certainly have been hard situations through these many years when the enemy came with strategies to steal, kill, and destroy the covenant we made before God, family, and friends. Our weaknesses and vulnerable areas have been tested and tried. We have given in to the enemy’s strategies, but what he meant for our harm we have chosen to trust God’s grace to work together for our good. The very areas the enemy has tried to steal have been the very things that have made us strong. The very things meant to divide have bound us together. It is because of those stumbles and those falls that we know we haven’t arrived here on our own, and in fact, they keep us trusting God even more. We know God deserves all the credit! And this needs to be my attitude towards all my life. God made a covenant with me when I believed in His Son, Jesus, as my Savior. He adopted me into His family and has promised never to leave me or forsake me. He has promised to take care of me and to provide for me. I am here to be loved by God, to know Him, and to be known by Him. Everything I am and all that I have is from God! And so my response to others should always explain my faith. Rather than taking the credit or leaving the truth hidden, I must take the opportunity to give God the credit and to share the truth of who He is and of what He says! This titled intrigued me, and I love your example of how we can share our faith in every day interactions. I think it’s easy in today’s world to keep our faith quiet so as not to offend anyone, but oh such a loss of opportunity! Thank you for reminding me to be bold in giving God the glory, even to strangers. Yeah, I’m finding that when I flavor my conversations with a little “salt” many times people respond much differently than I would expect. It seems the enemy convinces me that others don’t want to hear or that they don’t care, but when I step out, I realize it was just a lie to keep me quiet. However, I have also found that when I am bold to explain my faith, I will face tests along the way. 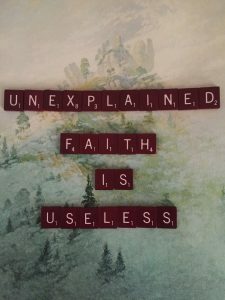 My blog this week I’m sharing about a test of faith I just went through even before I published my blog last week. I”m challenged to live the faith I explain! Thanks for your words of encouragement, and I pray you too will not listen to the lies, but push through and find the joy of explaining your faith boldly!